Week two of my B&A Trail Half Marathon training is in the books. This week was fun because I got to experience multiple seasons during my different runs. If you are on the east coast, you know what I mean! Each week during this training cycle, I will share how my training went and what the week looked like. I do this because: 1) I love reading about how other folks train and 2) it’s great for me to have a record of what I did each week. Also, honestly, it helps keep me accountable when I know I’ll be writing about it. I also post almost all of my runs on Instagram as well. 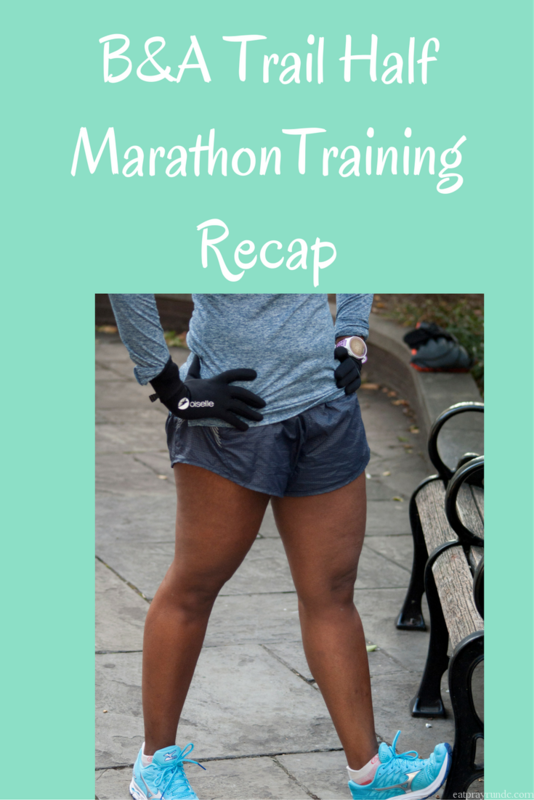 I’m starting a weekly link up for Training Recaps – let’s support each other as we train this winter! Please do link up! Monday: Easy 4 + Pure Barre after work. Tuesday: Track Tuesday! 6×800 with a goal time of 4:07 for each 800 – I came in at 4:05/4:03/4:13/4:04/4:00/4:05. With a warm up and cool down, I ran about 6.5 miles total. Wednesday: Rest day is the best day! Friday: Easy four with Dawn – cold but not nearly as bad as Thursday. Saturday: Oh dear. Saturday was a hot mess. No, scratch that. It was a COLD, freezing mess. Ice blanketed the city and so each step was a challenge. However, Leeanne, Christina and I got in just under 6 miles. And boy did I earn the nap I took later that day. Sunday: Easy six with my buddy Katie – the miles flew by as we caught up! I applaud your icy long run! Curious, do you have access to a treadmill in case the weather ever gets unsafe to run? I’m very much an “avoid the treadmill at all costs” kind of woman myself, so I’m usually screwed if forced to not run outside. I do not have a gym membership and we don’t own a treadmill. There is one in the gym at my office but that’s a few miles away. So I don’t have easy access to a treadmill. I can count on one hand the number of times I’ve used a treadmill in the past 3 years. If we owned one, I think it’d be different! We experienced winter, winter, and polar vortex. It is so cold here–I can’t even imagine. We had such a nice, mild fall too. Way to play your cards, mama nature. Super glad I’m not training for anything right now. Ugh. HOW RUDE, Mother Nature! It was cold, snowy, and icy in Columbus this week– no shorts weather. I don’t have access to a treadmill and prefer running outside… but ice stinks. Naps are a great recovery! 😉 Great mileage this week, despite the weather! Thanks lady! Ice is not awesome. but we didn’t fall! Oh, I can’t believe you ran yesterday! I opted for Revolve and then went for a run this morning — it was so warm in comparison! Oh my goodness I ran in shorts this morning – totally crazy! Awesome job getting out there in some harsh conditions. I was challenged a bit myself this week as it just got colder and snowier as the week went on so I can really relate to what you were dealing with. Hopefully all of this will build some awesome mental strength for us that will ensure we rock our races! You are seriously my hero. HOW was it possible to run on Saturday??? And kudos for getting your tempo run in on crazy cold day. That wind was brutal! Great job with your training! Saturday was absolutely awful, I didn’t want to walk the streets let alone run…but of course you nailed it! Janelle @ Run With No Regrets recently posted…Introducing Tunes Tuesday – New Linkup! Well…we didn’t fall, so that was successful, I think 🙂 I also didn’t leave the house again after getting home that morning! Wow, Your tempo paces are freaking awesome. And yes, we are experiencing all the season. My long run Sunday was 80 and sunny – so hot. Yesterday when I was out it was 48, cloudy, rainy, and windy – felt cold. Thanks Abby – I’m terrified before each tempo run. Seriously, haha. OH, my gosh, this up and down weather has been so ridiculous! You stuck with it, though, and got everything done – woo hoo! Way to go, Courtney! I’m so glad it was a good training week for you!